Emmanuelle Riva, Jean- Louis Trintignant, Isabelle Huppert. A powerful film, one of the best, if not the best of 2012. It won the Golden Palm at Cannes, 2012, and a BAFTA, Golden Globe and Oscar for best foreign language film. In the letter to the Corinthians, St Paul describes love as patient and kind, not jealous, conceited or proud, not selfish, irritable or ill-mannered, it does not keep a record of wrongs, love never gives up. This is the kind of love/amour that we see in this film. And it is most admirable, a love that has lasted for decades, has changed from initial Romance to mature companionship and parenting, to the demands of old age, illness and impending death. Writer-director, Michael Haneke, an Austrian film-maker whose films are often made in France and in French, as is this film. He has won several awards from Ecumenical Juries at film festivals, Code Inconnu, Cache, The White Ribbon. The latter won the SIGNIS (World Catholic Association for Communication) prize for a European film in 2009. 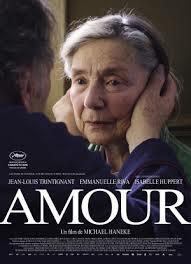 Amour won for 2012. The acting is extraordinary – and that sounds like an understatement. Jean-Louis? Trintignant, a veteran French star, best known around the world for A Man and a Woman, was 81 when he made this film. Emmanuelle Riva, who is known for Hiroshima, Mon Amour (1959) was 84. The performances are so naturalistic, realistic, that we feel we are watching real people in actual situations rather than watching acting. Basically, this is a story of age, of illness and caregiving. We see the gradual stages of decline, stroke and its consequences. We see the helplessness of the wife, her attempts to communicate, the pain and sadness of her suffering. We see the constant and meticulous attention of her husband, day after day, his weariness but his persevering until it becomes too unbearable for her and for him. Apart from attendance at a concert at the opening of the film, the action is confined to the apartment of the couple. There are some visitors, especially their daughter, played by Isabelle Huppert, who lives abroad and does not seem to understand age or what is really happening to her parents and how that has to play out day by day. The wife was a piano teacher which leads to several musical interludes which allow some moments for the audience to sit back before they respond again to the plight of the couple. Perhaps the action may seem remote for younger audiences, but for most, it will be a moving experience, some appreciating better what caregiving constantly requires, others knowing that this future is possible for all of us. 1. The impact of the film? For older audiences, midlife audiences, younger? Depending on lived experience? Caring for older people? A film for understanding, appreciation? 2. The acclaim and the awards? 3. The work of the director, Austrian perspective, working in France? The cast, age, experience, sensitivity? 4. The confined situation, audiences sharing the experience of Georges, of Anne? The performances being so real? 5. The introduction? Anne’s death, laid out, the police breaking into the apartment, its being sealed? The importance of this for the whole film, the audience knowing the ultimate fact? Watching what led up to this? 6. The couple, the years together, the developing love, taking each other for granted? At the concert? The long shot, the audience watching the concert audience, finding Georges and Anne? Their enjoying the concert? The aftermath? The meeting and discussion, congratulations to her student? it? The range of musical interludes throughout the film, the pianist and his performance? 8. Anne as the focus of the story? The performance by Emmanuelle Riva, an ordinary but special woman, at the concert, her socializing, the details of life at home, comfortable, the meals, shopping, talk, sharing? 9. The stroke at the table, her losing awareness? Georges and his talking? Her silence? The water, the tap, his concern, her not believing him? Continuing the conversation, her puzzle? The book of photographs, her gaze, the audience seeing their life together? 10. Georges and Jean- Louis Trintignant, alert, doing the shopping, helping with the house, the caring for Anne? 11. Eva, her life, marriage, the visit, her attitude? Unfaithful husband, putting up with him, her son and his absence, the music? Her concern? Sitting and talking with her father? The later visit, her husband and their discussions about care for her mother while failing to understand or see what Georges was doing and the effect on him? The next visit, Georges locking the door, pretending to be in the toilet, his apology, Eva going in to see her mother, her grief? Being upset for herself, not for him? The final sequence, her coming into the empty house, the ordinariness of the scene that the audience was left with? 12. Anne’s deterioration, hospital, her paralysis, the detail of care that she needed, washing, falling out of bed, food, drink? Her moods, tantrums, irritable, Georges hitting her? 13. Georges, meticulous in taking care, the time spent with his wife? His own feelings, physical limitations, mental exhaustion? His emotions? 15. Anne, weaker and, Georges tending to her, the sudden impulse, smothering her? 16. His sealing at the apartment, his own fate?